Each year, the operators in the Alpine republic give each other a neck-and-neck race. This year sees a change in the top rank – after a competition on a overall high level. Since we had expanded our great network test to also in­clude Austria and Switzerland in 2009, Austrian operators are con­stantly the best comparing all three regions. They frequently battle for the overall lead on a very high level. Good news for Austrian ­mobile customers: They can choose between three strong operators – at considerably ­lower tariffs as in the neigh­bouring Germany. Only high ­roaming fees in the non EU neighbour country Switzerland regularly annoy Austrian smartphone users. in Austria was able to improve its score compared to last year‘s its ­­results from the ­previous year. In the summer of 2018, also Hutchison/Three has introduced VoLTE as the last of the Austrian operators. So, now this modern 4G telephony mode is available in all three Austrian networks. In the previous year it was A1 alone offering the VoLTE tech­nology to their customers. This is clearly ­reflected in the measurement values – T-Mobile and Three catch up to the high results of A1 concerning call setup times and speech quality. Actually, now T-Mobile connects calls in the shortest time. With the exception of the walktests in large cities, Three scores at a clear distance behind its two stronger competitors. The values determined in smaller towns and on the connecting roads fall back considerably compared to those in the cities. Compared to the previous year, T-Mobile improved the most in the voice discipline. But also A1 and Three were able to step it up a notch in this category. The results of the data measurements are also on a pleasantly high level – and also quite close. The results of the drivetests and walktests conducted in large cities account for the very high performance of all three Austrian mobile networks. A little more ­surprisingly, this is also true for the smaller towns and the con­necting roads. The success rates of web page downloads are on a high level for all contenders. A1 and T-Mobile score almost the same here, while Three slightly falls behind in this category. T-Mobile counters with slightly faster file uploads. When playing back ­Youtube videos, all three are on a similarly high level. All in all, the scores achieved in all the examined regions indicate the same ranking: T-Mobile takes the lead, A1 Telekom follows on the second rank, and Hutchison/Three on the third. Compared to last year‘s ­results, T-Mobile managed to slightly improve, A1 is overall on the same level than in the pre­vious year, while Three fell a little behind. Especially in comparison to its large neighbour in the north, the Austrian operators offer respec­table performance also on the railways. 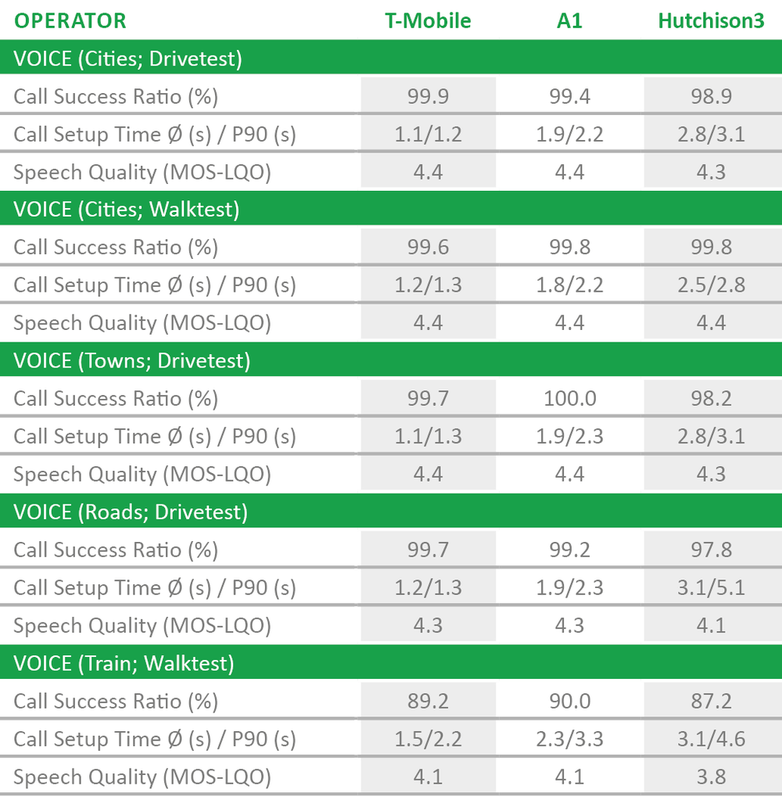 However, when looking at the results of the previous year, only T-Mobile succeeds in im­proving its score in the railway category of this test – thanks to better voice results. Regarding telephony in railways, A1 and Three fall a little behind. Here, the market leader A1 still ­achieves the highest score, ahead of its two competitors. When accessing the internet while travelling on trains, the penalty is even bigger. In this discipline, only T-Mobile is able to defend the results from last year, while A1 and Three clearly fall back. A possible explanation: The Austrian Railways have strongly improved their WiFi offering in the trains. This is clearly benefiting ­travellers, but leads to a higher strain on the mobile networks which serve as the backbone. Additionally, some effects can be attributed to the stricter test requirements of this year. So, all in all, the Austrian operators show some room for improvement on the railways. ­However, compared to Germany, Austrian train customers have every ­reason to be happy.